Manages the pages of your PDF documents. The PageManager allows you to create, remove, insert and replace pages from within PDF files. . This functionality is similar to the Insert, Extract, Delete and Replace options within standard Acrobat but with additional functionalities. 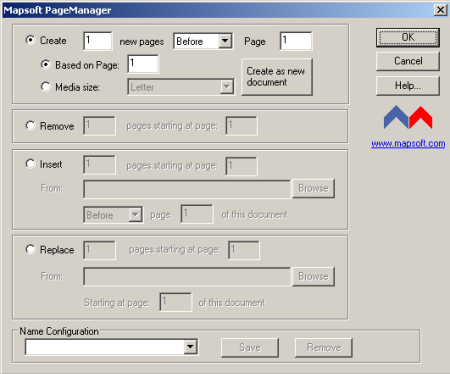 The PageManager allows you to create, remove, insert and replace pages from within PDF files. . This functionality is similar to the Insert, Extract, Delete and Replace options within standard Acrobat but with additional functionalities such as the creation of a new (empty) PDF document and the specification of the size of any new pages that are to be inserted.